The rock art known up to now in Cimbergo territory concentrates in Cam-panine, a very large area placed to the west of the village, at a height between 400 and 800 metres above sea level and on a mountain–side interrupted here and there by small plateau and marked by steep rock walls. The recent complete analysis of the area stresses the presence of 102 carved rocks and a millenaries–old frequentation, covering just in this case also historic times (14th–16th centuries). 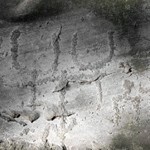 The prehistoric rock art at Campanine shows and undisputable local identity, a range of styles and subjects which clearly distinguishes this area from the other sites of the Middle Valley, though the same common figurative code appears to be here in use as well. Noteworthy is, for example, the unusually great number of water birds, the peculiar typologies of the building figures, the several quadrangular–bladed axes and the many footprints marked by unique varieties even compared to sites similarly rich of the same subject, such as Foppe di Nadro and Naquane. The visiting routes open to the public cover only the area of Campanine Alta, whose core boasts the most representative presence of Middle Ages engravings, while some contiguous sub–areas are kept closed because of preservation reasons. For a basic view of the site it is recommended to visit R. r.1, 5-6-7, 8, 21, 20, 23-26, 25. The site can be reached after getting the ticket at Nadro Museum and driving the road linking Ceto to Cimbergo. As soon as the plain area at the foot of the rock hill where the Cimbergo village rises appears — its ruined fortress clearly visible on the northern border of the village — there is a parking place and the starting point of the main route, which goes down along the deep gorge of the Rè stream. After about 15 minutes walking from the entrance the path reaches a little chapel and the first rocks supplied with touristic panels. 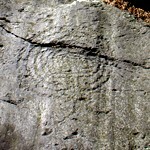 A big rock surface comprising two engraved sections. The lower panel is distinguished by a rare figure of labyrinth of “Cretan” type, with seven spires in one whole course from the outside towards the centre. The labyrinth, a fairly unusual symbol in Camunian rock art (other instances occur at Naquane, Zurla, Luine, Dos del Mirichì, Piancogno) may evoke a complex journey that transforms the ones who make it, so it is probably linked to rites of passage (birth, puberty, wedding, death). In this case, the labyrinth is associated with square-bladed axes and a monstrous figure of horned and ithyphallic bird, likely from the mythological sphere. Around this central scene more images are visible: huts, other warriors and footprints. The second panel also shows the hut motif and footprints. This remarkable engraved section, just above a small farmhouse, was covered by soil and vegetation. Today it appears like an outcrop in itself, which continues to develop the imagery of rocks 6 and 7. Rock 5 is characterized by the co-presence of historic and prehistoric figures in superimposition: in the upper part you can fairly clearly see figures of huts, a scene of deer hunt (very rare at Campanine), a scratched labyrinth and several warriors, attributable to the Iron Age; the central and lower sections are hard to make out because of sundry superimpositions, however you can distinguish writings in North-Etruscan characters and in Latin (“IOVIS”) and more recent Christian crosses . Particularly important, on the right-hand side, a figure that can be compared to the Christian iconography of the “Saint Peter” holding three keys. 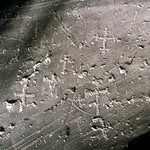 On the contiguous R. 6 the first engravings to be noted are several crosses and two extraordinary dates (1319 and 1330) written in Latin numbers (that is “?CCCIX” and “?CCCXXX”. The “?” sign indicates a late evolution of the classical “M” and follows a palaeographic rule which does not go over the 15th century. 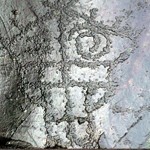 However the most striking rock art here is composed by the great number of scratched images, among which several gallows (in one case with the condemned person hanged by one foot), Solomon knots, inscriptions, stairs–shaped figures, five–pointed stars, crossbows, some large heraldic symbols (such as the crowned eagle, symbol of the powerful local Federici family), couples of dices (perhaps a metaphor of the Passion of the Christ), a priest on his knees with a mitre covering his head, a human figure holding a sickle (the Death? ), an image of a tuber — recently interpreted as a possible representation of the magical mandrake root — and other schematic signs of difficult identification. This rich and complex panel gives evidence of the intense frequentation of this area between the end of the Middle Ages and the beginning of Modern Age and puts the historic engraving activity (at least in this site) under a completely new light. 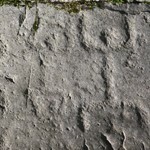 The act of carving signs on the rock in historic times in fact should not be simply read as a Christian way to consecrate or exorcise previously pagan sites — a widespread opinion until recently — but as a real parallel engraving activity, led, according to the erudite origin of most of the subjects, by educated people, perhaps members of the clergy or even of the middle class who right in that period was more and more strengthening her power not only in Valcamonica but also throughout the entire Italian society. The rock outcrop, in the past partially covered with soil and vegetation, includes with no interruption R. 5, 6 and 7. R. 7 is the large top surface and shows praying figures, sometimes in vertical or horizontal combination, some building figures, warriors and quadrangular–shaped axes dating back to the Middle Iron Age. On an isolated part of the rock, some metres to the north, there is one of the largest building representations (more the 1 m high) of the whole Valcamonica rock art, while on the upper part it is possible to observe a very rich panel of historic times (13th–14th centuries), carved with more than forty images of keys, crosses and other Christian symbols. The key sign has been recently interpreted as a statement, especially from a symbolic point of view, of civil power and may be linked to the several representations of buildings (castles, towers, and fortifications), coeval or later to the keys, that can be found on the rock immediately below. This is a small but significant panel, representing what probably are the oldest ploughing scenes of Europe: two couples of yoked “bucrania” with a coeval set of figures. The chronology of this composition is still uncertain: scholars suggest a time range that goes from the late Neolithic (mid IV mill. BC) to the Copper Age (2,900 – 2,200 BC) and the early Bronze Age (2,200 – 1,600 BC). 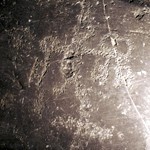 In late Neolithic-early Copper Age stylized patterns are common and the (rare) oxen are represented as stylized “bucrania”; furthermore, on this panel the bucrania are in close connection with a “maculae”, the first topographic representations. On the other side, the complex structure of the plough seems to suggest an early Bronze Age typology. Going further downslope it is possible to observe, within a convoluted rock outcrop, R. 20 and 21. Uphill of the historic path the highest part of the outcrop rises and is denominated R. 21. 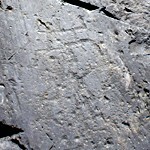 The surface is carved with many praying figures next to several Iron Age warriors and to isolated pictures of quadrangular–bladed axes. R. 20, downhill of the path, shows other praying figures and warriors. 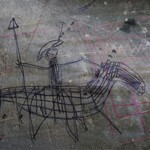 In addition to this an interesting historic section composed by tangled scratched pictures can be observed. Among the figures it is possible to distinguish a horseman with a small triangular shield — a weapon that can be clearly compared to defence tools used between the 13th and the 14th centuries AD. The rocks 23 and 26 make a unite group scene of historic time, from XIV to XV cent. c.e. On Rock 23 there are only three subtle lines, running lengthways on the whole surface, with quadrangular arches at the bottom and a small cross at the top. Rock 26 is incredibly rich of scenes made with the “filiform” (scratching) technique, which include some reticula, that could represent towers; a possible parade through crested tents, a dressed knight wearing a crest, an armed horn player, standards and standard bearers; a completely armed man wearing a helmet, an armour, a big sword supported by chains and a small triangular shield; two drafted knights, one of which has a big spear, and other less easily recognizable figures, among which are some horses. The great tower was made in a later phase during the XV century, with the pecking technique; it has a portal and Ghibelline battlements, hosting the small figure of a standard bearer, who is holding a large flag with a key on it. The whole scene is of great interest and conveys a sense of freshness. It is composed of a large surface carved with plenty of images, in some cases almost completely erased by the wearing due to passing people. The most noteworthy petroglyphs are the groups of praying figures, some warriors of the Iron Age and a couple of tiny footprints turned downhill.